The Complete Poems of Anna Akhmatova. Translated by Judith Hemschemeyer. 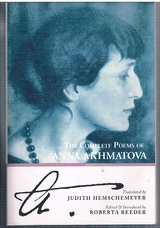 Home » The Complete Poems of Anna Akhmatova. Translated by Judith Hemschemeyer. The Complete Poems of Anna Akhmatova. Translated by Judith Hemschemeyer. Edited & Introduced by Roberta Reeder.